Every college program deserves a homecoming of sorts: an opportunity for people to reflect on their experiences and learn from fellow alumni. Williams-Mystic’s homecoming is the annual alumni reunion that takes place right where it all started: Mystic, Connecticut. The 41st Williams-Mystic Reunion took place September 21-23 under the direction of Lyndsey Pryke-Fairchild (F’03), Katy Robinson Hall (S’84), and countless other alumni and faculty and staff members. For maritime historian Alicia Maggard, this was her first time experiencing a Williams-Mystic reunion. Alicia fully enjoyed her time speaking to alumni of various ages. Each conversation taught her something different about what it means to be a Williams-Mystic alumnus. As a faculty member, Alicia worked behind the scenes to help make sure the events on each day went smoothly. While doing so, she was able to connect alumni with current F’18 students. Alicia thoroughly enjoyed meeting alumni who have dedicated their lives to the maritime industry as well as those who are working in different career fields. For example, Alicia mentioned an S’88 alum who spoke to how many of his classmates chose to work in the maritime industry or remain passionate about maritime topics — and also how Williams-Mystic teaches students how to approach issues in a way that can be useful whatever career you pursue. Matt Novosad, an F’17 alumnus, commented on the live auction portion of the reunion. Alicia also enjoyed the live auction. Another highlight for both Alicia and Matt: Josiah Gardner (alias Glenn Gordinier, Williams-Mystic’s just-retired maritime historian) made an appearance. “Going to the reunion this year was a great chance for me to catch up with my classmates, one of whom flew in from Minnesota,” Matt said. “Life changes, but Williams-Mystic is something that will always bring us together. THANK YOU to all those who helped with the Reunion this year. Your dedication to Williams-Mystic is evident. See you next year! When Spring ’17 student Natalie DiNenno stumbled across an article about climate refugees in Alaska, she wondered if she had found her marine policy research topic. Studying sociology at Williams had taught Natalie to “think about research in terms of people and places,” and she hoped to carry this approach over to her policy research project at Williams-Mystic. Guided by marine policy professor Katy Robinson Hall (S’84), Natalie decided to explore climate adaptation not in Alaska but in southern Louisiana — and, in particular, in many of the communities, we visit during our Louisiana Field Seminar. Just over a year after Natalie’s Williams-Mystic semester began, Natalie and Katy presented their research at a Log Lunch, a weekly gathering hosted by the Williams College Center for Environmental Studies and featuring speakers on a range of environmental topics. In advance of their talk, Natalie reflected on her research, on how her experiences on the Louisiana Field Seminar complicated it, and on the lessons, it has to offer other communities imperiled by rising seas. Read on to hear her thoughts. Chris Hernandez, Town Supervisor of Grand Isle, LA, speaks to students about his barrier island town’s eroding beaches. Chief Shirell Parfait-Dardar speaks in front of a community cemetery threatened by land subsidence. When I was originally looking into project ideas, I found an article about Alaskan climate refugees. I thought that might be interesting to explore, but I didn’t know how it intersected with marine policy. I’m a sociology major, so I tend to think about research in terms of places and peoples. [Marine Policy Professor] Katy [Robinson Hall] suggested that I look into land loss into Louisiana, and the decision that the people living there have to make: restore the coast, or retreat? I never would have thought about this in terms of policy, but as I did further research I realized that people can’t just decide to do either of these things by themselves without government organization, legislation, and funding. Another key takeaway: land loss is fast, and governments are slow. This is a dangerous combination. Approaching the project, I asked questions including: Why restore the coast? Can it be done? What work has to be done in order for people to conduct organized resettlements? Who advocates for restoration, and who advocates for retreat? Where does funding come from, and what happens if there is no funding? My conclusion, in brief, is that while Louisiana should pursue restoration where possible, due to the rapid loss of land, the government should prioritize resettlement and dedicate funding to this effort. Land loss happens more rapidly than restoration. It is better to save communities by moving them than to focus purely on restoration (particularly in places that primarily benefit energy and oil interests), because if they are not saved now, they will simply break up and wash away as residents move individually. Describe a moment of the Louisiana Field Seminar that stands out to you. I distinctly remember meeting Chief Shirell [Parfait-Dardar of the Grand Caillou-Dulac Band of the Biloxi-Chitimacha Choctaw Indians] and being surprised by how young, energetic, and passionate she was. The way she spoke about her tribe and what they will lose if nothing is done was heartbreaking, but she also had an incredible amount of joy and hope despite how desperate their situation is. How did your experiences in Louisiana shape your research — either the way you carried it out or the questions you asked in the first place? Katy told me before we left that I would return from the field seminar even more confused and conflicted than I already was, and she was right. Without the field seminar, my analysis of the issue would have been much colder and less personal, with more emphasis on advocating for retreat. But seeing the people who live there, and how connected they are to their land, made me reconsider how difficult it really is to just pick up and move. I think that if I had written the same paper for a class at Williams, and not at Williams-Mystic, I would have lacked an understanding of the coastal way of life and just how important the ocean is to people’s lives. Williams-Mystic allowed me to see the world in a way that was completely different than learning that takes place solely in a classroom. What do you wish more people understood about climate adaptation in coastal Louisiana and regions like it? For these people, climate change is happening now. That’s true for a lot of places — in the form of extreme weather conditions, storms, and changing temperatures, but the actual physical loss of land is more concrete. There are people living in these regions who can point to a body of water and say “there used to be a beach/house/restaurant there.” It doesn’t even matter if there aren’t any more storms; the land will continue to sink and the sea will continue to rise. When people think about climate change, I don’t think they often picture land disappearing. But it is. Jaime Hensel (S’03) arrives at the ceremonial South Pole, Williams-Mystic burgee in hand. During Alumni Reunion Weekend 2017, Alexander “Sasha” Bulazel (S’85) posed a challenge to his fellow Williams-Mystic alumni: Take a picture with the Williams-Mystic burgee at one of our planet’s extremes,* and Bulazel would donate $25,000 to Williams-Mystic. Not two months later, Jaime Hensel (S’03), arrived at the Amundsen-Scott South Pole Station with the Williams-Mystic burgee in hand. For Hensel, a nurse practitioner who is half of South Pole Station’s medical team this austral summer, this moment had been years in the making. It began during her Williams-Mystic semester, when her experience offshore — she spent her twentieth birthday sleeping on the deck of the Corwith Cramer — inspired her to pursue tall ship sailing after graduation. Throughout her five years in the tall ship world, Hensel met shipmates who’d been to Antarctica. As on the Cramer, an idea took root. That idea persisted, even as Hensel found herself in other places she never expected to. Aboard the schooner Adventuress, for instance, Hensel read a book by the vessel’s captain about his experiences walking the Camino de Santiago. Not long after, she found herself on the Camino. It was there her life took another turn, when a new friend she met there helped her decide to pursue nursing. Throughout her years at the Yale School of Nursing, Hensel continued to consider going to the South Pole. She applied three times after graduating in 2013 before, in the spring of 2016, she was granted an interview. Hensel reached the Amundsen-Scott South Pole Station on November 1, 2017. The station, her home until February, sits at 9,306 feet above sea level, perched atop a 9,000-foot thick ice sheet that drifts as many as 33 feet each year. For Hensel, this world of extremes felt familiar. “It’s an awful lot like living on a boat here,” she explains over the phone five weeks after her arrival at the South Pole. Resources are scarce. The station’s inhabitants, numbering up to 150 most austral summers and 40 most winters, relate to each other as shipmates. Like sailors, they communicate using their own argot. Their uniform comprises government-issued red overcoats (“big red”) and white boots (“bunny boots”). Inhabitants even refer to their kitchen as a galley. They work hard too. Everyone takes turns cleaning shared spaces. Hensel and the station’s doctor spend sixty hours a week in the clinic and alternate being on call during off hours. The entire station is that way: a self-contained unit. All its supplies have to be flown or hauled in over three summer months. Though the station is moored atop more than a mile of ice, residents are limited to two two-minute showers each week because even extracting water demands scarce fuel. Inhabitants manufacture their own fun, too; Hensel’s learning to unicycle, cross-country ski, and even drive snowmobiles. When Hensel sailed aboard the schooner Adventuress, she learned to view the “boat as a metaphor for a small planet”: a world of finite resources, resources that must be managed by the people reliant on them. For Hensel, this “small dot in the middle of a large, frozen sea” felt like home for precisely this reason. * These extremes include: the North and South Poles; the Marianas Trench and/or another significant point on the ocean floor; or, the top of one of the world’s tallest mountains (e.g., Everest or K2). Bulazel has pledged up to $100,000; i.e., he will donate $25,000 for each of the first four alumni (including Hensel) who takes a picture with our burgee at one of these places. Contact us at wmalumni@williams.edu if you are going somewhere that might qualify! We’re profoundly grateful to Alex Bulazel for his generosity and to Jaime Hensel for her adventurous spirit (and for taking the time to talk about her experiences during a rare moment of satellite coverage). If you want to hear more about Hensel’s experience — or simply learn more about life at the South Pole — I highly recommend her blog: https://henselbelowzero.wordpress.com/. If you want to embark on a South Pole journey of your own, Hensel says she would be happy to hear from you; you can reach her at jaime.hensel@gmail.com. On March 11, 2011, a tsunami devastated Japan’s coast. More than six years later, marine organisms na tive to Japan and representing nearly 300 species are still washing up on North America’s coasts. These are some of the findings of a major study published September 29 in the journal Science and authored by a team led by Williams-Mystic Director Emeritus James T. Carlton. Most of these organisms, the study revealed, clung to manmade materials. The implication: Plastic marine debris, already polluting the world’s oceans, could increase the number of non-native marine species that cross these oceans. “This study of a remarkable ocean rafting event of unprecedented magnitude and duration reveals for the first time the profound role that plastic marine debris can now play in transporting entire communities of species in the world’s oceans—for far longer lengths of time than historic dispersal on natural substrates (such as wood) would have been possible,” Carlton says. The study drew together a team from across the country. Williams-Mystic’s own James and Deborah Carlton joined with researchers from Oregon State University, the Smithsonian Environmental Research Center, Moss Landing Marine Laboratories, and the Oregon Institute of Marine Biology. They also relied on more than 200 volunteers to collect marine debris starting in 2012 and continuing through today. As late as this September, Jim and Debby could be found cataloging dozens of specimens in Williams-Mystic’s Marine Science Center. The team has won accolades not just for their study’s scope but also for its imaginative approach. 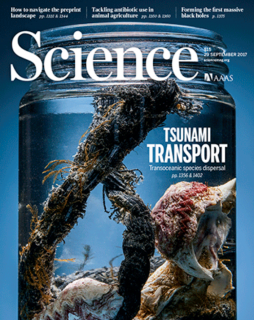 “These scientists have taken the unusual tack of looking at a natural disaster and coming to new conclusions about how our activities and structures influence species distributions in the oceans,” says David Garrison, program director in the National Science Foundation’s Division of Ocean Sciences, which co-funded the research. In short, Carlton’s ground-breaking research suggests, natural disasters like the Japanese tsunami coincide with social and economic developments to radically alter marine ecosystems the world over. The upshot–that now more than ever, addressing marine environmental issues demands an interdisciplinary approach–should sound familiar to any Williams-Mystic student. The full paper, “Tsunami-driven rafting: Transoceanic species dispersal and implications for marine biogeography,” can be found here. See also this accompanying video, articles in the New York Times and Washington Post, and features on the websites of Williams College and Mystic Seaport. Shanti Hossain (F’16) explores the Port of Oakland aboard a tugboat as part of the California Field Seminar. Shanti Hossain (Williams ’19) attended Williams-Mystic for the Fall 2016 semester, during her sophomore year. One year later, as a junior pursuing a double major in Computer Science and English, she reflects on her semester at Williams-Mystic and the impact it has had on her time at Williams. What drew you to Williams-Mystic in the first place? I wasn’t considering attending Williams-Mystic at all until my freshman spring, the semester before I actually attended. On the first day of the semester, there was an informational meeting with Tom Van Winkle, the Executive Director, and several alumni from the program, and I decided to pop in. I wasn’t seriously considering the program, because I didn’t think I was the ‘type’ of student to do Mystic. I was pretty sure I wasn’t going to major in anything like Biology or Environmental Science, and while I appreciated the ocean and its importance, I wasn’t obsessed with it or wanting to study it for the rest of my life. But when the alumni of the program started talking, I realized that a lot of them were just like me. A lot of them didn’t have any particular reason for wanting to dive into studying the ocean, but they loved the program anyway–because, like all Williams students, we just love to learn, and Williams-Mystic really celebrates learning in all its forms. What surprised you about the program when you got there? The admissions directors of Williams-Mystic often said that the hardest part about recruiting for Williams-Mystic is trying to describe the program in one sentence, and I think that’s absolutely true. If you think about it just as “the Maritime Studies program” or “the program where you live on a boat,” then you’re really failing to capture so much of what the program is. You could just as easily describe it as “Interdisciplinary Studies 101,” or “Learning to Live in a Community,” or “Primary-Research Bootcamp,” or “Proof that Domestic Study Away Can be Just as Eye-Opening as Study Abroad,” and all of those descriptions would capture some crucial part of the Williams-Mystic experience. How has Williams-Mystic changed the way you think about your studies? I’ve always been interested in interdisciplinary studies; I think most of us at Williams chose to go to a liberal arts college because we’re passionate about so many different things. Part of the Williams academic ethos is taking classes across the divisions, making connections across your classes. But it’s somewhat up to you to craft a program of study that pushes you out of your comfort zone and allows for those cross-discipline connections. Williams-Mystic basically says: what if we all stopped for a semester to focus on studying one thing, the ocean as a case study, and learning what it means to experience it from every possible perspective? The program is crafted so that you’re constantly making connections, constantly relating one subject to another. The professors plan their lessons so that it happens. Our campus is a museum, so we’re constantly surrounded by our subject material. I’ve learned how important interdisciplinary learning is to me, and now that I know what true commitment to it looks like, I’m pursuing that as much as I can for the rest of my time at Williams. How did your classmates’ perspectives change your experience? One of my favorite parts of the program the community-living aspect of Williams-Mystic, because it gave me the opportunity to learn so much from my classmates. Academically, we do so much throughout the semester that it’s absolutely impossible for you to excel at everything. And as a result, you’re constantly bringing out the best in one another. Maybe someone’s great in one class or another, but then someone else brings a constant supply of energy to your skills class, or is that one person who’s really, really good at entertaining everyone on long car trips, or teaching housemates to cook. Because residential life and extracurricular life and travel life are just as important as academic life, it moves the focus from competing academically to growing as people, together. What about Williams-Mystic do you think will stick with you a decade from now? My experiences on the field seminars–the trips across the country we took with our professors–will stay with me for a long time. It was just an incredible experience to sit as a group in one spot, maybe on the banks of the Mississippi River in Louisiana, or overlooking the Golden Gate Bridge in San Francisco, and have that one spot inspire a lecture from our history professor about a historical event that happened there, then having our English professor read and analyze a poem inspired by it, and then have our policy professor talk about the different maritime laws that impacted who used this space, and how. It showed me just how many perspectives there are around every single place and event and opinion, and it showed me how valuable–and exciting–it is to learn about as many of those perspectives as you can. This piece was written for and originally published in the Center for Learning in Action Chronicle, a publication of Williams College’sCenter for Learning in Action.